WYSKR is a start-up building a new kind of data-driven, mobile-first digital content engagement platform for today's new marketplace of ideas. The problem WYSKR's addressing is that engagement with digital content could be creating a lot more value for content creators and consumers. WYSKR's strategy is based on three concepts: a "Moment-first" focus, a "Virtuous Triangle" format, and a Co-creative approach. Hi, I'm Vernon Marchal, founder of WYSKR Inc. WYSKR is mobile-first, data-driven, social media-focused web application. I'll be providing more detail via our blog, but right now I'd like to give you an early look at the platform (above) and start sharing some of my thinking via this site. WYSKR is passionate about capturing more value from digital content. WYSKR's mantra is "be curious." WYSKR believes people are most engaged - and at their best - when they're being curious. WYSKR's strategic first principle is: engagement = "being in the moment." WYSKR's mission is to maximize the value of these moments. I invite you to keep up with developments by reading the WYSKR blog, subscribing to WYSKR e-mail updates and following @WYSKR. Engagement with digital content is an important part of the digital economy, and it could be creating a lot more value both for content creators and consumers. On the one hand "creators" - like media companies, learning organizations, agencies, brand publishers, native advertisers, content marketers, thought leaders and event organizers - are not adequately reaping the rewards of their best efforts. On the other hand, "consumers" - you and me - are not adequately benefitting from these best efforts. WYSKR wants to help solve this problem with a new kind of digital content engagement platform that employs a unique focus, format and approach. WYSKR cares about capturing more value from digital content engagement for three reasons. First, with the proliferation of mobile devices, the influence of digital content on the global economy is increasing. WYSKR wants to help shape that influence for the better. Second, there's abundant evidence that curiosity not only drives engagement but that it's at the heart of human fulfillment and success. WYSKR wants to help foster it. Third, in every corner of the web talented people and organizations are working hard to cultivate compelling ideas and turn them into quality digital content. WYSKR wants to help support these efforts because if quality is rewarded you get more of it. WYSKR has developed a three-part strategy for success based on broad experience in all areas of the digital content enterprise, including production, editorial, design, tech, marketing, ad sales, e-commerce and product development. Mobile devices are now by far the most important engagement facilitators in the digital economy, and success on these devices is measured in moments. Competition on mobile is evolving into hyper-competition, requiring what WYSKR is calling a "moment-first" focus on adding value. You'll be able to read more about WYSKR's "moment-first" focus and the other 2 parts of its strategy on the WYSKR blog. You're invited sign up for WYSKR email updates to be notified when each new post is published. 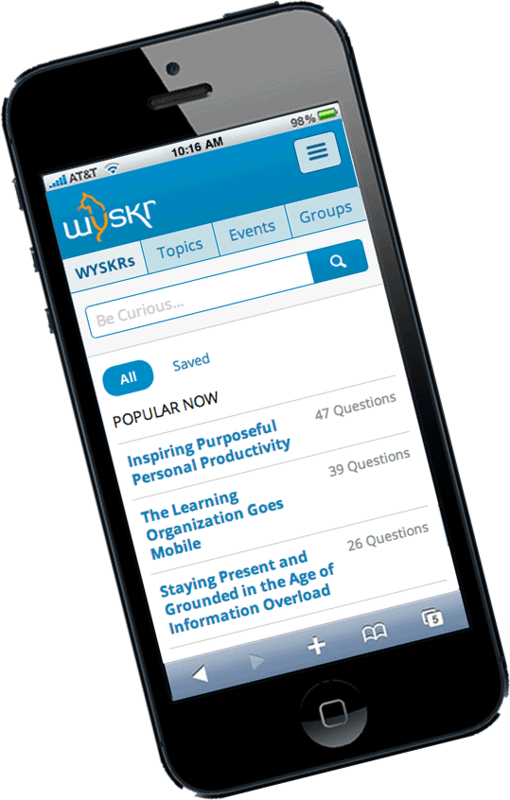 WYSKR believes people are most engaged and at their best when they're being curious. WYSKR thinks that three things in combination have the most impact on driving curiosity: ideas, people and events. WYSKR views ideas, people and events as forming a "virtuous triangle" where each amplifies the impact of the other. More to come on the "virtuous triangle" in WYSKR blog. WYSKR's goal is to create an engagement platform that breaks down stakeholder silos and empowers co-creativity. WYSKR thinks this approach is the best way to capture value in a hyper-competitive mobile environment. More to come about "co-creation" in the WYSKR blog.